We’ve all heard of command hooks, right? Genius invention to hang stuff on your wall without damaging it or making anything permanent. 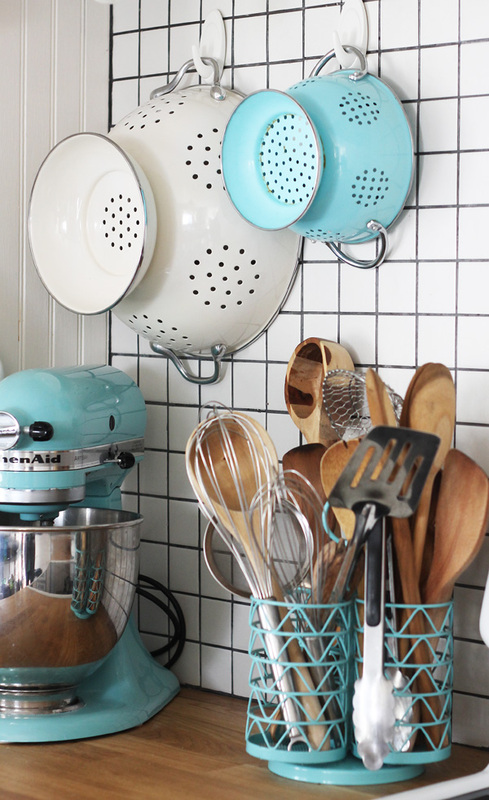 Did you know that there are TONS of other uses for those magical little hooks? 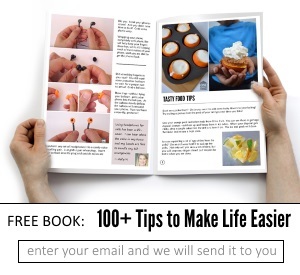 Seriously, some life-saver ideas that can save you time, money, sanity…you name it! 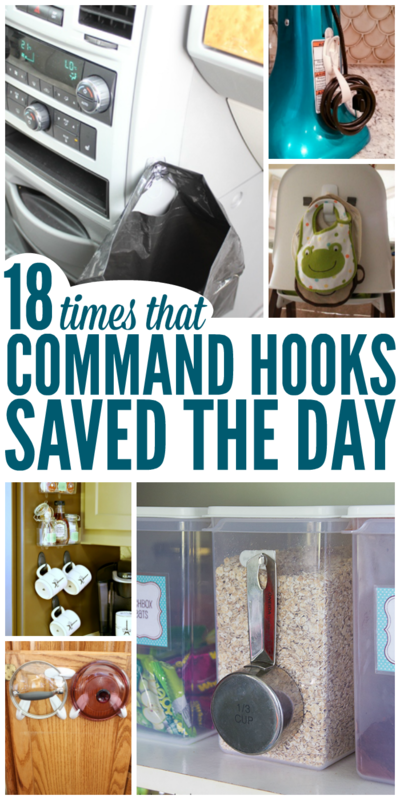 Check out our list of 19 times that these tiny little hooks came to the rescue in some unexpected ways! 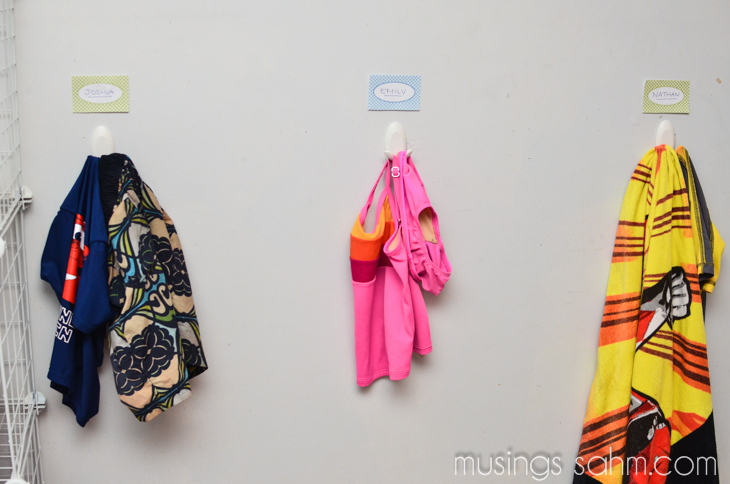 How many times have you hung wet bathing suits outside to dry (they get crunchy that way, ew) or over the side of your tub/shower curtain rod? Keep all the water dripping INSIDE the tub by simply attaching a hook to the inside of your tub/shower. 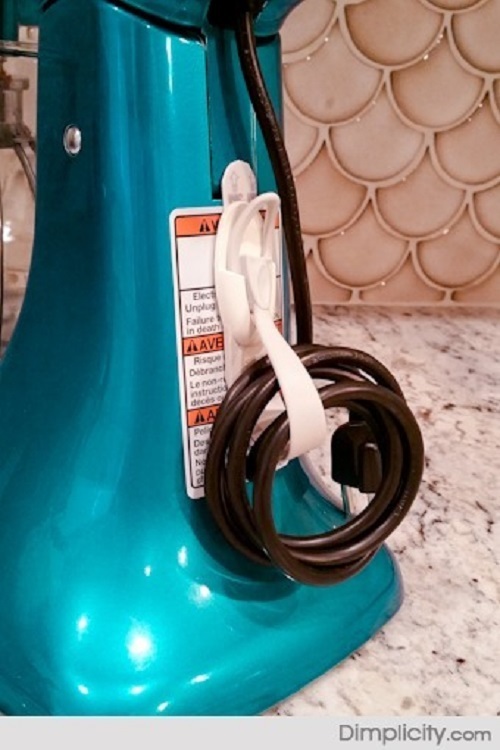 I leave my KitchenAid on the counter, but I hate the thick cord sitting on the counter with it! Easily hide it with a command hook instead. 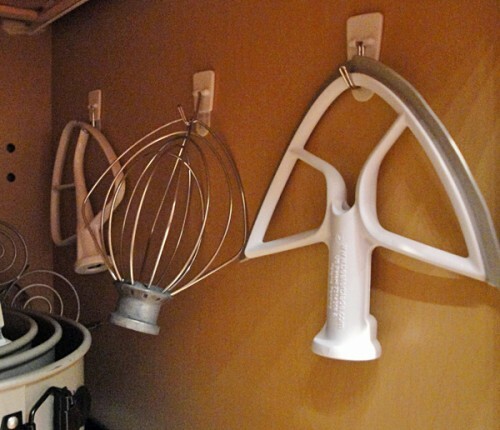 How about the hooks for your stand mixer? They don’t exactly fit in a drawer, and they take up too much room anyway. 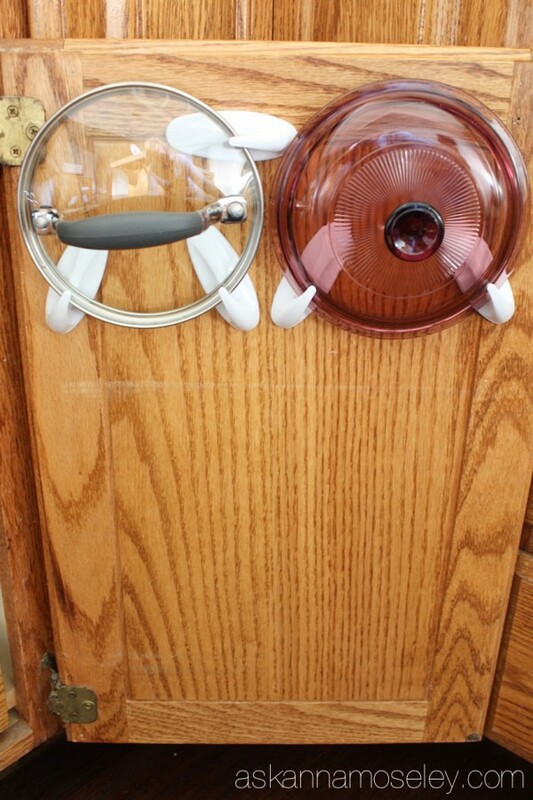 Use a command hook to attach it to otherwise wasted space inside your cabinet. 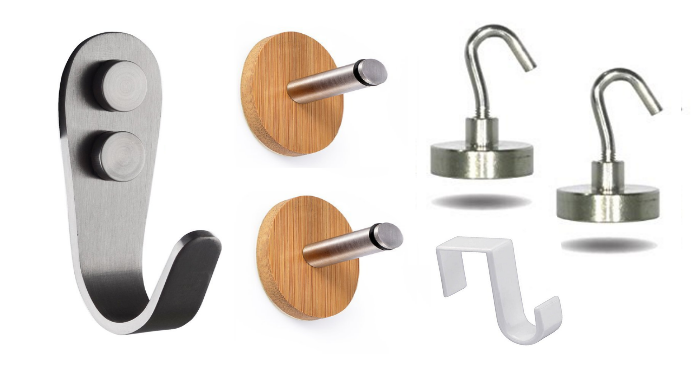 Command hooks can come in all shapes and sizes, from clear to white even to brushed nickel! 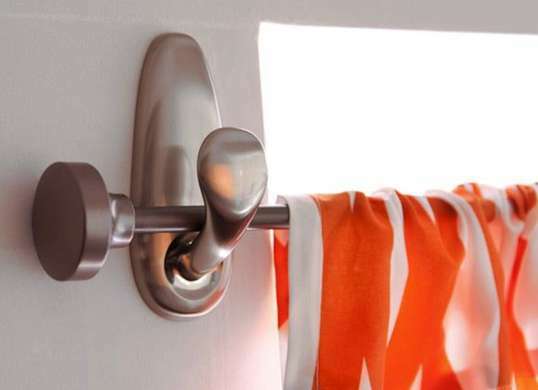 If you don’t want to (or can’t) install hardware for your curtain rods, chances are pretty good you can find a command hook that will match or complement your curtain rod. 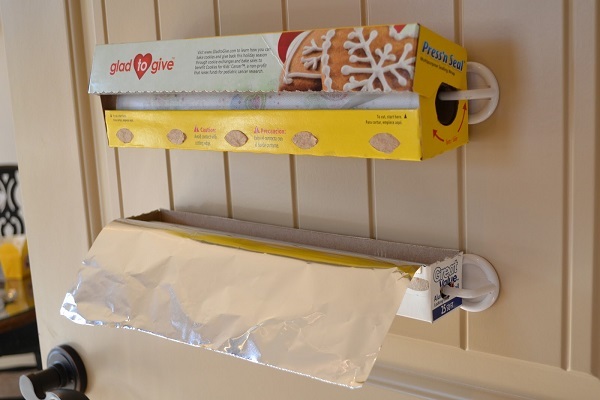 Create a clever system to store and USE your plastic wrap and foil using two command hooks. These can be installed anywhere, but we’d suggest the inside of your pantry door, or on a shelf. Most of us reuse grocery bags as trash can liners in the smaller trash cans throughout our house right? Great way to reduce, reuse, recycle! 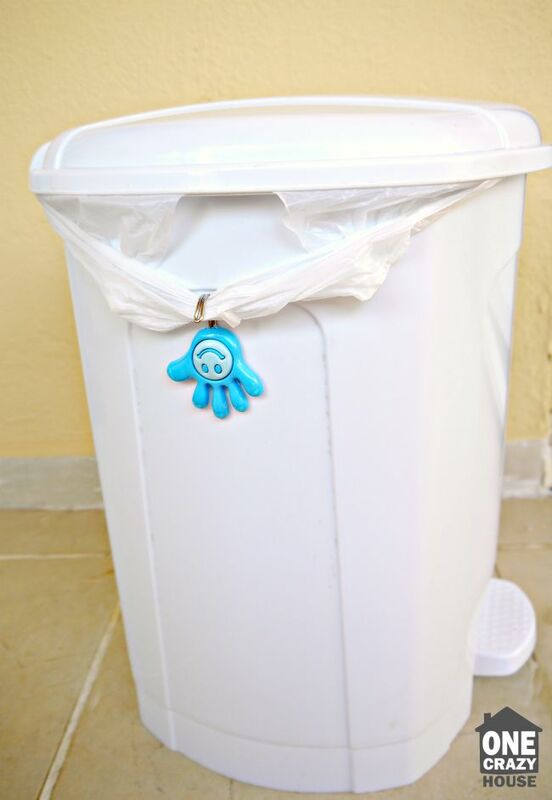 But very annoying when the grocery bag slips down inside the trash can and half your trash ends up outside the handles…not anymore! Secure two command hooks right where the bag handles reach on the sides, and just slip them over the hook. 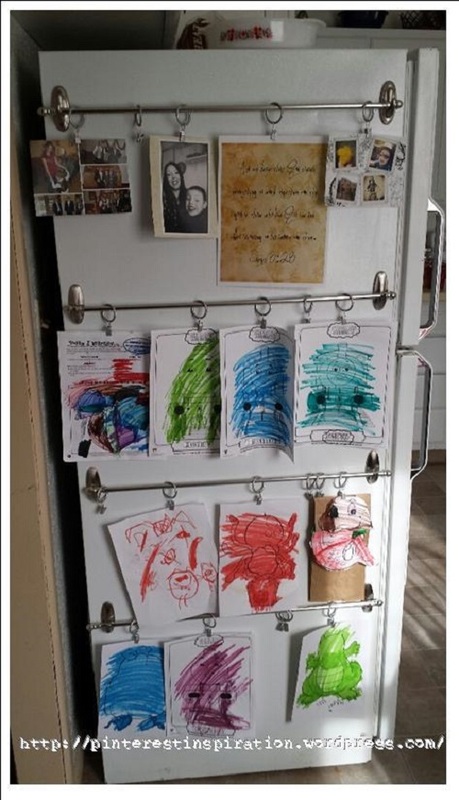 This system can be installed on your fridge, or in a play room – virtually anywhere! 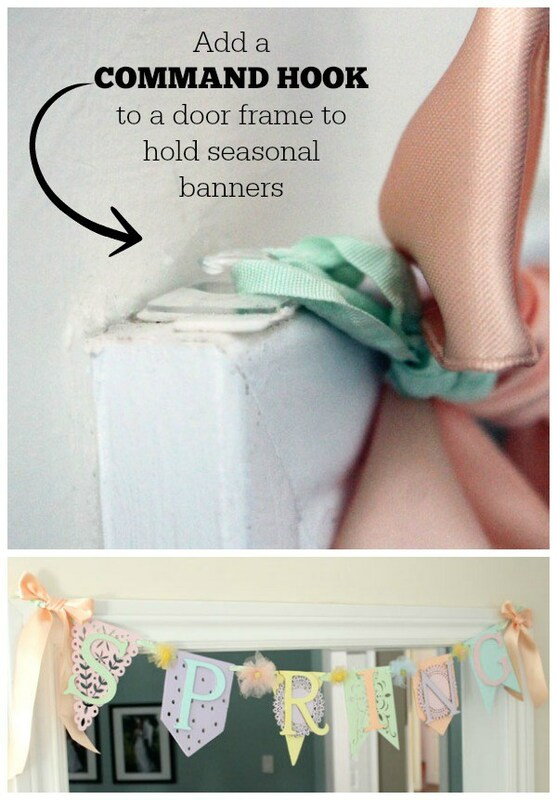 Just use two hooks, a thin curtain rod and some hooks, and you’ve got a clean, easy display for tons of their artwork! 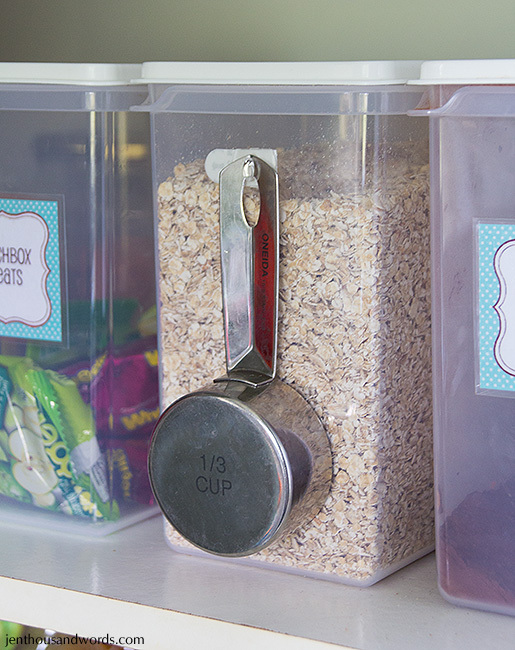 Keep a scooper or measuring cup right on the container of cereal or oatmeal to make breakfast as seamless as possible. 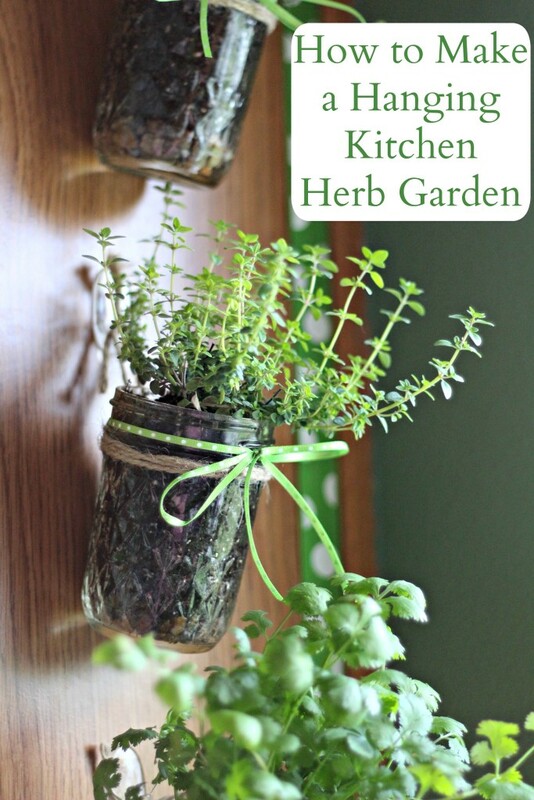 Find the spot in your kitchen with the nest sunlight, plant a few herbs, and attach them with command hooks! Simple, beautiful AND functional. Share a shower caddy? Too much stuff on it? Try this for a handy solution. 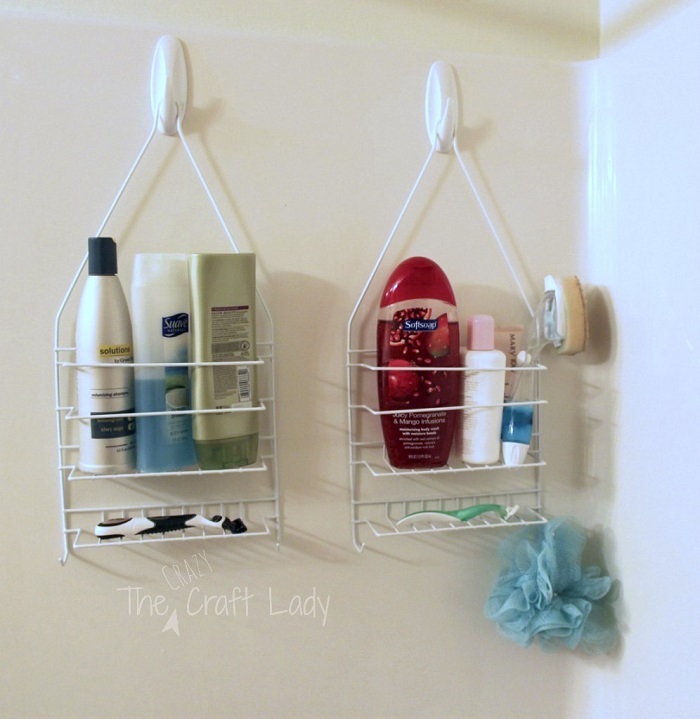 Instead of sharing one caddy, install two right on your shower wall with command hooks. Easy, and plenty of space for everyone’s everything! This storage solution gets stuffed animals off the floor, can be customized to fit any color scheme or size you need, and is easily removed when you no longer need it. 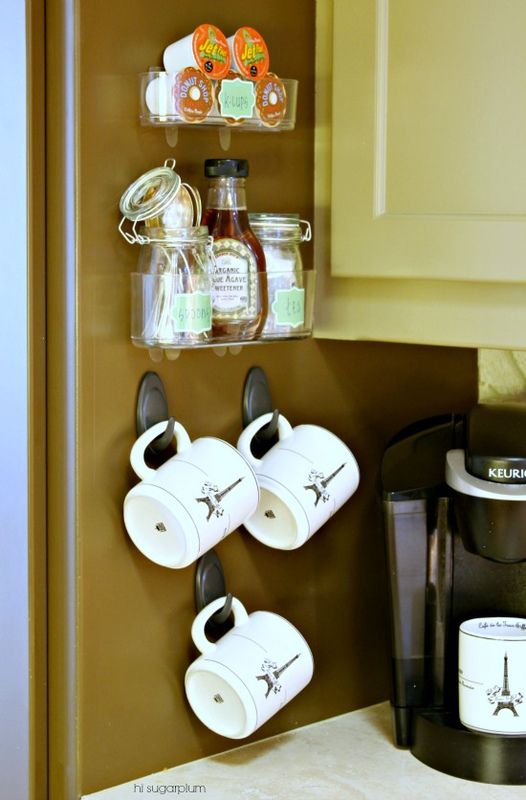 You can easily attached some hooks underneath the bottom of your cabinet to hold coffee mugs –it looks pretty AND it clears up room in a cabinet – score! You won’t find an easier method to hang a banner from the top of a doorway – if you’ve tried tape before, you probably know that just doesn’t hold. And who wants to install any kind of hardware or end up with nail holes for something so temporary? Command hooks on the top of the door frame are not visible, hold well, and are the perfect solution. 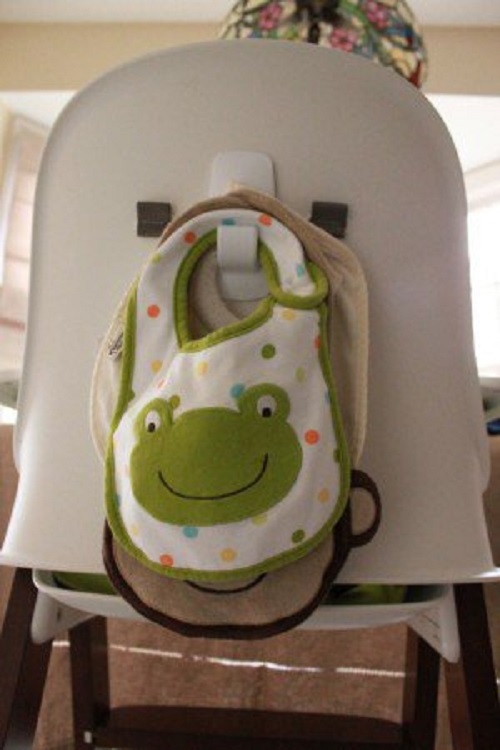 Why not store baby’s bibs right on the back of the chair? Using a command hook makes them easily accessible and easily hidden. Command hooks attached right to your backsplash can provide some easy storage – it can look really pretty, AND your favorite kitchen tools are handy when you need them! 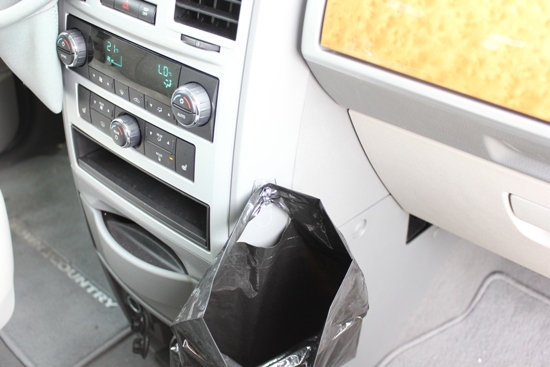 Everyone needs a trash bag in their car – to buy one specially made to attach somewhere in your car can be really pricy, and you’re often limited on where you can put it. With a command hook, simply choose where you want it, attach the hook and hang a small bag. Done! Seems like no one has ever found a really good way to store lids to the various pots we keep in our kitchen. Until now! This idea is genius…just attach two hooks for each lid to the inside of the door and you’ve got the perfect storage space! These are NOT your Grandma’s hooks! Add instant space with some of these more modern, durable options. Wood Adhesive hooks. Comes in a 6 pack! And each hook can carry slightly over 4 pounds in weight! Declutter your space instantly with a set of 4 magnetic hooks! These are perfect for lockers – and each can carry 25LBs!! That is enough for most backpacks! Two-Pack Metal Heavy Duty Hooks. These are perfect for towels or coats and comes with mounting hardware. Over the Door Hooks. A set of these will free up a bunch of space in your bathroom! Promise! No more towels on the floor! 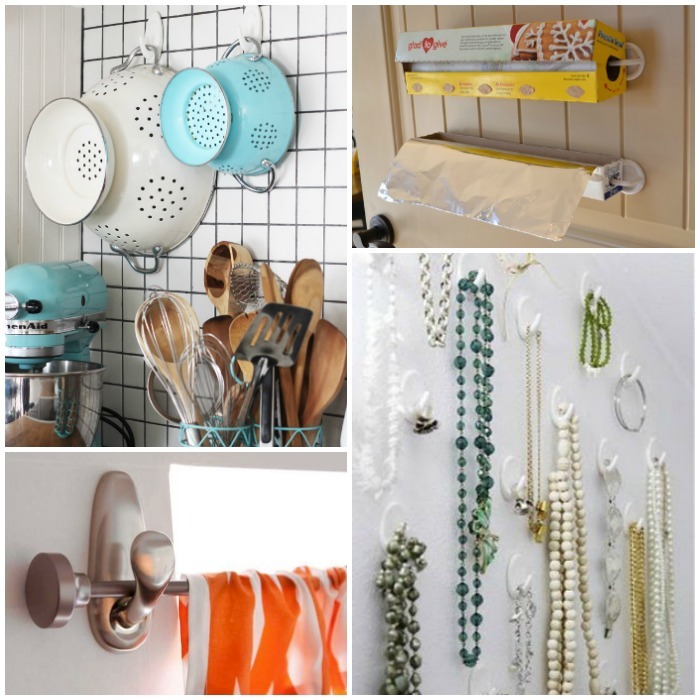 Are you a fan of command hooks? I bet if you weren’t, you are now! Which idea was your favorite? I don’t know about you, but I sure know that I’m planning to stock up on these the next time I go to the store – I can’t wait to try out some of these!